I just read your interview in the March 2014 Pharmacy Purchasing & Products insert. It moved me to respond and share a success story from my hospital. We installed an IV Workflow system (DoseEdge™) in our pharmacy in late 2010. During dose preparation the technician must scan barcodes on the drug, diluent and fluid to ensure the ingredients are correct. They also take pictures of the amount of drug in the syringe before injecting into the bag for the pharmacist to verify. We average 20 intercepted errors per week. I believe most of these would have been caught by the pharmacist, but…… In addition to DoseEdge there are several robotic and manual systems on the market. Perhaps in a future publication your foundation could advocate for barcode scanning in all sterile compounding. P.S. I really like the angel label idea and plan to incorporate into my process. I get so encouraged when I read things like this. A special Thank You goes out to Stephen Speth for sending me this note. It means we are starting to win the battle for patient safety, and gives me more motivation than you can imagine to press on! Please click on the image below to download a pdf of the scanned article as it printed in the latest issue of Pharmacy Purchasing & Products Magazine. Speaking Engagement at Vermont Children’s Hospital at Fletcher Allen a Huge Success! Just wanted to follow-up on the presentation I gave at Vermont Children’s Hospital at Fletcher Allen Health Care on March 5th. 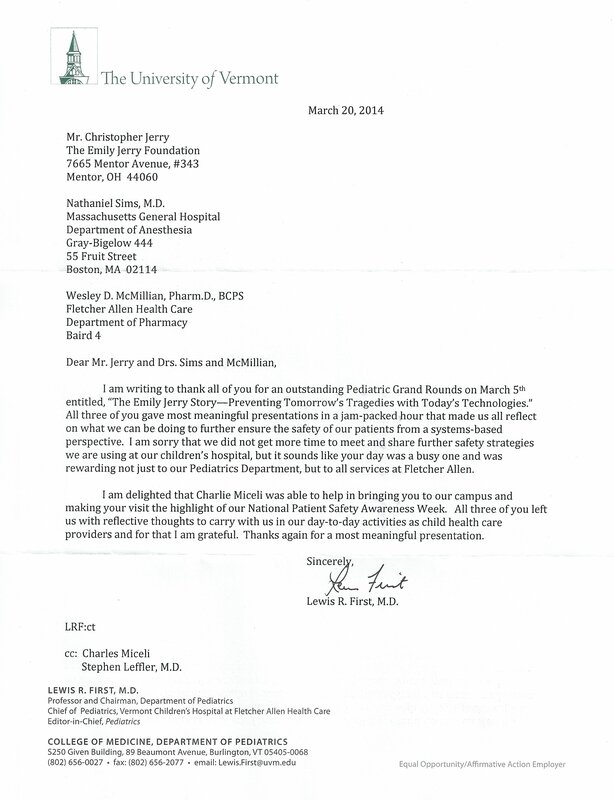 The entire Pediatric Grand Rounds event went great, as evidenced by the awesome Thank-You letter I was sent by Dr. Lewis First, the Chief of Pediatrics at Vermont Children’s Hospital. I always get energized by these incredible events, especially seeing the passion that the caregivers have for making their facilities a safer place for patients. I can’t thank them enough for giving me the opportunity to come visit and share my story. See a scan of the full letter below!